I Started riding 3/19/16 and joined Princeton Freewheelers in 8/19/2016. 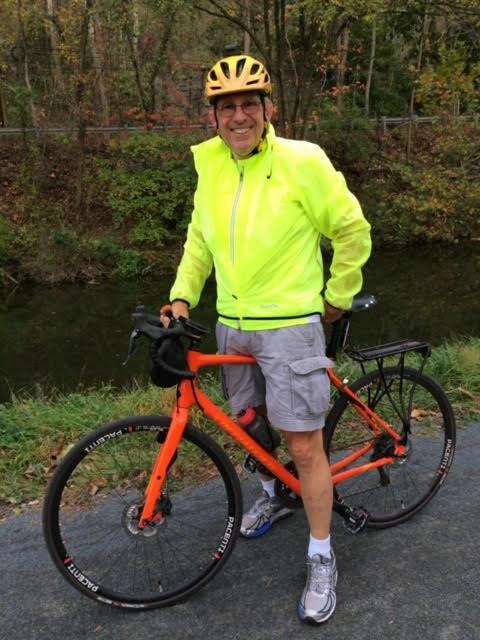 To me, cycling means getting outside and having fun on the towpath, and yes, almost all my riding is on towpath, my friends have come to call me “Towpath Man” it’s a handle I’ve come to appreciate for good reasons! Hopefully In a few weeks, as of this writing, I will have completed 10,000 miles of cycling in one year. WooHoo! Through my cycling I’ve created great bonds with wonderful people younger and older than me, even with people around the world who share the same joy of cycling through my apps and photos. I’ve become an amateur photographer, sharing my experiences through my picture journey. I’ve learned to appreciate the beauty of where I live, and the many adventures the towpath offers including rescuing turtles, seeing all the wildlife such as geese, squirrels, snakes, and even helping others; also joining a group of bikers along the way and the joy of riding with them. Biking to me is freedom, gives me confidence, it’s fun and fitness. It’s has been a life changing experience even at age 66. Cycling is life.